It's all about targeting the most common places where allergens hide. Spring is finally here! And after months of being cooped up with the windows shut and heater blasting, I'm thrilled to finally air out the house. This is the ideal time to prepare for the warmer months and rid your home of any indoor allergens with a thorough spring cleaning. The most common indoor allergens that trigger allergic reactions, asthma spells or eczema flareups are dust, dust mite droppings, pet dander, mould, cockroaches and food. The best way to prevent and reduce these reactions is to eliminate these allergens from your environment. 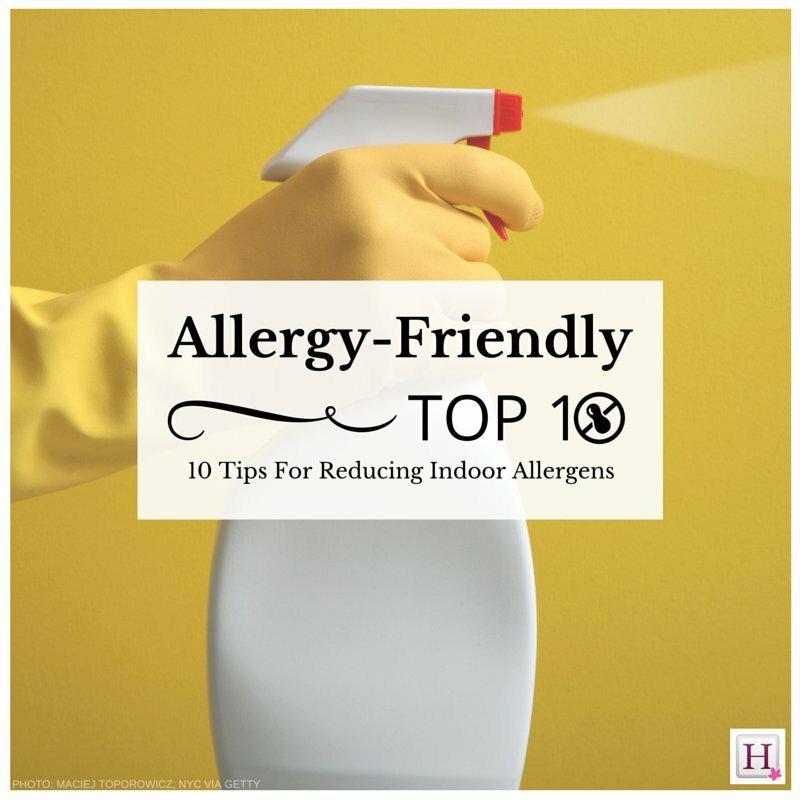 While allergens can be anywhere in your home, there are ways to maximize your impact by targeting the most common places where allergens hide. To help make cleaning more efficient, I've put together a list of my top tips for reducing indoor allergens. Ideally, your spring cleaning should be done early in the season, so that you can open windows and ventilate your home without letting pollen in. An indoor air cleaner like a HEPA (High Efficiency Particulate Arresting) air purifier can also help capture allergen particles, such as pet dander, dust, dust mite debris, spores from plants, mold and smoke. Carpets are the ideal place for dust and dust mites to live, especially if it is a shaggy or high pile carpet. It's important to vacuum weekly or more frequently if you have pets, but in order to completely remove your carpet of dust and other allergens, a professional steam cleaning is necessary every 12 to 18 months. Don't waste your energy doing it yourself, as puddles and long drying times could lead to moud problems. Every six months, area rugs should be taken outside, aired out and beaten with a broomstick. Dust mites love to feed on the dead skin cells in your mattress and bed sheets. Wash your sheets, duvets and duvet covers in hot water to kill dust mites, or freeze any non-washable bedding overnight. Use dust-proof mattress and pillow covers to minimize your exposure while you are in bed. And if you have a pet, make sure to keep them off your bed. To learn the proper technique for cleaning your pillows, click here. We open and close blinds and curtains daily, but they are usually an afterthought in our regular cleaning routines. Spring is the perfect time to do a deep cleaning on window coverings to prepare for the months of sunshine and fresh air ahead. Dust buildup on blinds and curtains is expected, but window coverings in the kitchen or dining room could also have potentially harmful food allergens or bacteria on the surface if they were touched with unwashed hands. Wipe blinds with a damp cloth and, if possible, wash curtains in hot water. Ceiling fans, bathroom fans and lamp shades collect a lot of dust, pet hair and other allergens. Clean them with a damp rag to remove the dust. Never use a dry cloth as this just stirs up dust mite allergens. Get rid of the piles of paper, laundry or magazines that may have been forgotten around your house. Cockroaches love to hide in these piles, giving them a place where they can shed body parts, and leave saliva and feces that can trigger both asthma and allergies. Use a humidity monitor to make sure that the humidity in your home is less than 50 per cent at all times. Mould and mildew thrive in high humidity, and mould spores can trigger allergic reactions, exacerbate asthma or cause respiratory infections. If needed, use a dehumidifier to keep humidity levels low in damp areas such as a basement. Any visible mould should be cleaned with a diluted vinegar solution to kill the mould entirely. Crumbs and spilled food inside or under your oven, toaster or microwave can attract cockroaches. The best way to prevent a cockroach infestation is to make sure that you do not have any food sources like unclean surfaces and uncovered food lying around. Fully clean the inside of your appliances and the spaces under and around them. Some linens rarely make it out of the closet, which would be the perfect place for dust mites to congregate. Empty out your linen closet and wash everything in hot water to kill off any dust mites. Make sure to wipe down each shelf with a damp cloth while your closet is empty. It may surprise some, but pollen and other plant allergens can cause allergic reactions indoors. Pollen can be brought into the house on clothes, shoes and pets. Thoroughly clean any rugs or mats located at the entrance of your house, and make sure outdoor footwear is stored away from your living area. Pauline Osena is a food allergy advocate and founder of HypeFoodie.com, an online resource for allergy-friendly living. This former dairy junkie became an expert in allergy-friendly cuisine while figuring out how to feed her child with multiple food allergies. Pauline aims to inspire culinary adventures and experimentation with her series, "An Allergy-Friendly Makeover," and shares the valuable knowledge she has gained from her trials, errors and adventures in living with food allergies with "The Allergy-Friendly Top 10." Pauline's short-term goals include getting a full night's sleep and drinking her entire cup of coffee while hot.